High in the mist-shrouded mountains of northern Laos, cut through by the broad Mekong river, is Luang Prabang, a town of glittering Buddhist temples and barefoot monks. 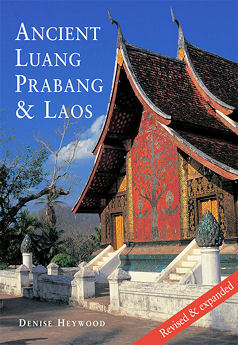 Remote and serene, Luang Prabang is often referred to as a Shangri La. It is a treasure-trove of Laos's artistic heritage, with ornately carved wooden temples covered in golden frescoes dating back to the 14th century Kingdom of Lane Xang, the 'Land of a Million Elephants', and colonial architecture from the French protectorate, a unique fusion of the urban styles of 19th century Europe with Lao motifs. Denise visited Laos numerous times while living in Cambodia, exploring Vientiane, the quiet riverine capital, and travelling to the far north and the border with China. She visited villages where hill-tribes such as the Hmong, Yao and Akha live traditional lives, the women adorned with silver head-dresses and heavy necklaces, and silk and linen costumes woven by hand. But this was almost a lost paradise. In the 1970s Laos was drawn into the war with Vietnam, and this landlocked country, with a population of only 4.5 million, became the most heavily bombed nation on earth. After the communist takeover in 1975, it was closed to visitors.